The greatest thing about surfing the net is finding all the neat programs you can download. I have found approximately a dozen freeware and shareware speaker design CAD programs which are of great use to the amateur speaker builder. Unfortunately, some "free" demos and shareware I have found are crippleware, which makes them nearly useless. Others are rather complicated, and require that you know a bit about enclosure design and provide very detailed information about the sub, much of which is not included with your average purchase. So I looked through my CAD software and came up with the programs I use most, and which I believe nearly anyone can understand. For some in-depth analysis about enclosures and design, go check out the JL Audio website and their excellent tutorials. If you know of any great free CAD programs I have not listed, please contact me! For those interested, here is an OLD List of CAD programs available for sale from the respective writers/manufacturers. Most should still be available, however. These files are zipped, so if you need a zip program, try this link to Winzip. Also, you MUST disable any download assistant program (like Getright) to d/l these files. Programs are rated between 1 (poor) - 5 (excellent) as indicated by the # of drivers . The information in parenthesis following the name of the program is MINIMUM OS requirements to run the program, i.e. DOS & Win3.1 programs will work just fine in Win95/98. Programs reviewed and listed on this page have been checked via scientific calculator and formulas for accuracy. A simple freeware program written in 1991 by C. Hoffman and freely distributed by AVI Sound International, Inc. This CAD software program may seem a bit simple, but it does a fine job. Figures ported and sealed enclosures, and provides response graphs for your review. Also has a limited crossover design utility (2nd order only) if you are planning on using passive units with your speakers. This program is accurate and easy to use. This program should run on any pc, even old CGA dinosaur models. I have included it in case anyone has an old pc lying around in mothballs that they want to stick in the garage as a dedicated design tool. See also DosBox & Perfect Box. This program, given free to all of us by Blaupunkt, is a freeware CAD program available for loudspeaker design (with a few limitations). This program is best utilized for automotive applications where space is at a premium. Blaubox is designed so that it will figure an "computer - generated optimum" enclosure smaller than an actual "optimum" enclosure - this to save room for the auto environment. There is no selectable Qtc for sealed speakers (default seems to be Qtc = 1.0), and ported enclosures are often figured at half the volume of their actual "optimum" size. Bandpass enclosures are also figured rather small, which means your bandpass design might sound boomy. If you know the actual optimum size (flattest response down to cutoff), you can input this into Blaubox. That said, you can choose between sealed, ported, single reflex bandpass, and dual reflex bandpass, or isobaric variations of these designs. A speaker database allows you to store info on all your drivers, available for instant review. It also plots the low frequency driver response, and you can display two separate enclosure/sub designs at once so you can see how different designs compare with each other (VERY useful). Although programmed with automotive applications in mind, this program works well for building home speakers too, as long as you remember the above warnings! I wouldn't recommend using default box sizes without further investigation if true "optimum" alignments are your goal. 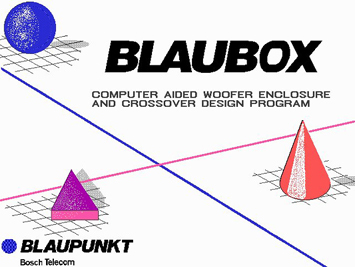 Blaupunkt has indicated that a Win95 based Blaubox might appear soon. 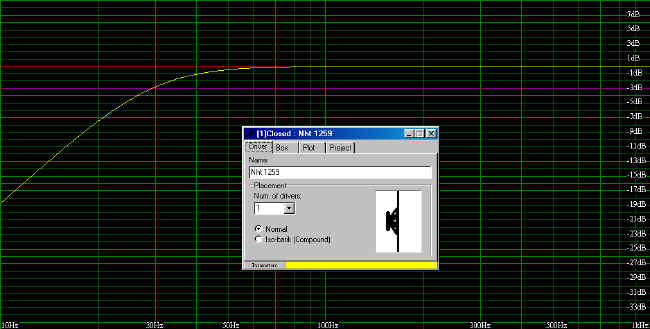 Written by Rick Carlson, Box Plot is one of the better shareware CAD programs available for loudspeaker design. Intermediate and advanced designers will have no problem with Boxplot, though the program assumes that you have a fair working knowledge of theory and design. Used correctly, this program gives an accurate model of loudspeaker alignments and theoretical display of driver performance in a variety of enclosures. The shareware is NOT crippleware like other similar programs of this caliber, but it does have it's limitations (ported & sealed only + nag message). Registered version ($25) is definitely more useful (41/2 drivers rating), and offers bandpass and isobaric designs as well as a good crossover design utility. This has got to be one of the best shareware CAD programs available for the amateur speaker builder. Calculates frequency response, port velocity, impedance, and cone excursion for sealed, ported and single-reflex (4th Order) bandpass boxes. Allows you to place the cursor within the plot on the graph for EXACT measurements at any given value. You must have a thorough and detailed spec sheet for your driver to properly use this program (or test the driver yourself!) The full version of this program also has group delay, step response and compensation for room and baffle size effects, and more bandpass alignments. This program is a must have for the serious amateur builder. This CAD program is a new version of the freeware from Mobile Dynamics, the car audio installation experts and trainers. Mobile Design 1.2 is very simple to use, and is much improved over the 1.0 version. It works great if you are trying to design sealed, ported, bandpass and isobaric enclosures (selectable Qtc), even with multiple drivers. The program is accurate in calculations and is straightforward in layout and design. It has some nifty new features as well, like the conversion calculator (for liters and cu. ft.) and a good box dimension calculator. No frequency response plots, but it does give you theoretical tuning and roll-off frequencies. Well worth the download, this may be the only program you use if you are looking for a quick and dirty CAD program that does a good job without all the bells and whistles. A good shareware CAD program that helps you compute several different configurations, including isobaric and push-pull enclosures. Watch out for the push-pull selection, as this program doesn't agree that a back-to-back/face-to-face driver mount is isobaric. If you are planning to build one of these Isobaric designs, simply choose Isobaric and ignore the push-pull option. Provides a driver database to store all your sub information, and includes a nifty frequency graph, as well as a table that displays theoretical low frequency SPL's. Also plots excursion vs. power handling, and can print any of it's graphs for a hard copy. The program figures true "optimum" alignments by default, but you can change enclosure size manually. This program provides accurate alignment changes when you experiment with enclosure volume and tuning frequencies. For all you dedicated builders out there who take nothing for granted (including driver spec sheets), Jonathon has written a program to help you test and determine Thiele/Small parameters for your sub! A great little program for the DIY speaker builder, or for someone with drivers and no specifications. Should work on all pc's, but you will need some basic testing equipment. Juha Hartikainen and the Linear Team have written this excellent program, and I have to say that it is probably my number one pick right now for the serious amateur speaker builder. Not only is this BETA software freeware, but it has very few bugs that I can find. An extensive driver database has just about every DIY manufacturer as well as automotive sub I could think to look up, and you can select one of these drivers or use your own driver parameters to input into the program. You can design sealed, ported, and 4th and 6th order bandpass, and there is a good passive and active crossover design utility. This program really has it all - along with the standard frequency response graph, you can plot phase, SPL and group delay. The best part about this is, like LSPCAD Lite, the program allows you to place the cursor within the plot on the graph for EXACT measurements at any given value. There is even a built in frequency generator! Probably the best thing going for this program for the beginner is the fantastic help menus. You can really learn a great deal about basic design from the tutorials, and you get all this for FREE! I don't know what else to say about this software, get it now! There is also a JAVA based version of WinISD. Cool little online program that lets you input basic driver parameters and get immediate enclosure information for closed, ported, and 4th order bandpass designs. Even graphs the projected response after you optimize the enclosure! Good for quick comparisons if you are online and looking at different driver specs. Revised: 11 Jan 2003 07:39:25 -0600.